Unlock a better career & life. To begin, it’s easier to start with three things that don’t work. Rebels. As much as I admire people who break the rules for good reasons, their actions tend to be futile when it come to changing a company. The rocks they throw at the corporate machine tend not to make much of a dent, and eventually the rebels becomes disheartened and move on. Grassroots movements. I want to believe that change at work can be democratic. Yet grassroots movements inevitably hit a kind of “grass ceiling.” Despite their good intentions and good will, there are limits to what they can do without changing structures and processes. Change from the top. If it’s difficult to order your children to change behavior, it’s impossible to order thousands of adults. Yes, managers do have significant influence, and they certainly have authority to allocate resources and make certain decisions. But they cannot decide on a culture, a mindset, or the behaviors that employees will adopt. Sustainable change isn’t just driven from the top or by rebels or grassroots efforts. It requires a bit of all three. An example that makes me optimistic about this recipe is something that’s happening at Bosch and Daimler..
Back in 2015, it was a “rebel” at Bosch who introduced Working Out Loud there. Her skill, passion, and perseverance enabled her to build a grassroots movement of several hundred people. She then inspired a rebel at Daimler to do something similar, and they continued to collaborate informally. As the movements expanded, there were now many people - not just rebels - making their work visible and actively growing their influence. They self-organized, and purposefully and opportunistically reached out to different divisions to find places where they could integrate WOL into existing programs. Over time, WOL found its way into the Corporate Academy, the on-boarding program, mentor programs, and more. 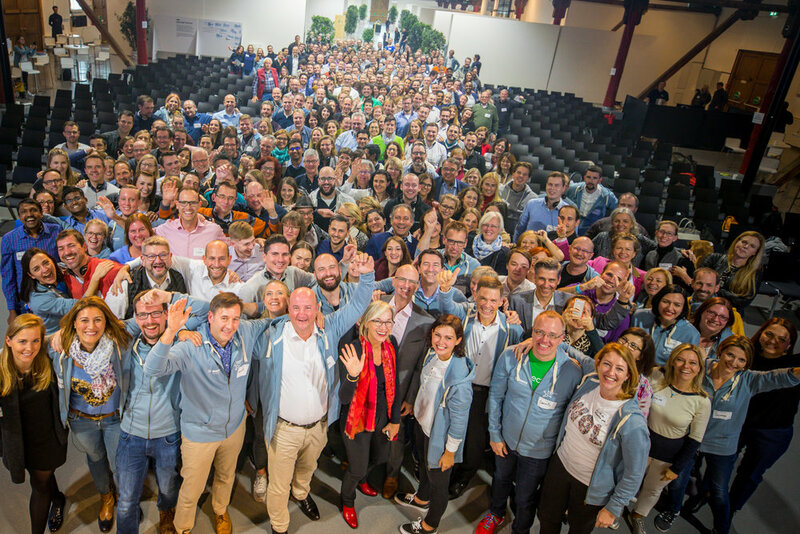 Their latest milestone was this past October 31st, when Bosch and Daimler teamed up to jointly sponsor WOLCON18 for 400 of their employees. In attendance were two board members, the head of industrial relations (including HR) at Bosch, and the Chairman of the General Works Council at Daimler. Though they’re typically on opposite sides of the negotiating table, a photo below shows them together supporting the grassroots movements to become something much bigger (and even wearing WOL hoodies with their company’s logos on them). Daimler issued a press release about it. "Working Out Loud proves that the digital transformation does not need to instill fear and worry. It comes down to how it is designed. If you make your work visible, you also learn what it is worth. And if you network, you find additional possibilities of belonging and recognition. The movements now include thousands of people. What was formerly rebellious has been embraced and institutionalized. What would have been unthinkable less than a year ago is now normal, and new possibilities keep emerging. Whatever change you’re hoping to bring about, the point is that the recipe for change really can start with you - and also that it must go beyond you. You have to connect the people who believe what you believe so you can amplify the benefits and make them visible. That’s what makes it possible to gain the management support you’ll need to scale your efforts, and to make the difference you want to make. I was sitting in the audience as the divisional CEO delivered his talk to over 500 people. He was encouraging them to try new ways of working, to experiment more, connect across silos, and continuously learn. Not only would it be better for them as individuals, he told them, but the company needed this kind of culture and attitude. The enthusiasm was palpable. Then he opened the floor to questions from the audience, and a hand went up. The employee's concern was understandable. Despite exhortations from top management, the new values posted on the walls, the cultural change program, it still didn’t feel safe to do things differently. Too many other people got into trouble doing that, so why take the risk? Without a sense of psychological safety - "being able to show and employ one's self without fear of negative consequences of self-image, status or career" - most people will wait until a critical mass has changed behavior before making a change themselves. How many people have to say “yes”? After the question there was an awkward pause. The CEO replied that it was better in this case not to ask permission. "You should just do it,” he said, explaining that the personal benefits were worth the risk. The audience didn’t seem satisfied. They wanted to do things differently, but they felt stuck. As happy as they were with visible support from top management, they knew the CEO wouldn’t be there if their boss doled out consequences. "I now realize there are things - tasks and interests - that bring me joy and satisfaction besides my original job but are still in a business context. I guess my next goal will be concerned with job crafting... ;-) "
Every day you have some control over who you interact with and what you do. Every day you have complete control over how you interact with others and how you approach the work you need to do. You can choose to experiment in small ways at work, to learn and explore more, to relate to others with generosity and kindness, to actively look for purpose and meaning in what you do. You can be a leader in one of the most important ways possible - by example. For that, the only person you’ll need permission from is you. Working Out Loud: How will it scale? “Are you ready for this?” she asked us. 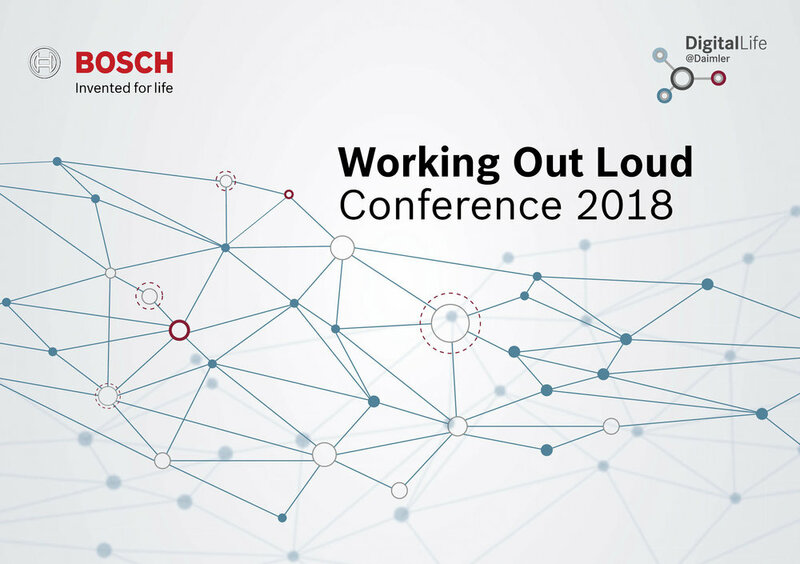 We were talking with two people from HR who were planning to accelerate the spread of Working Out Loud. 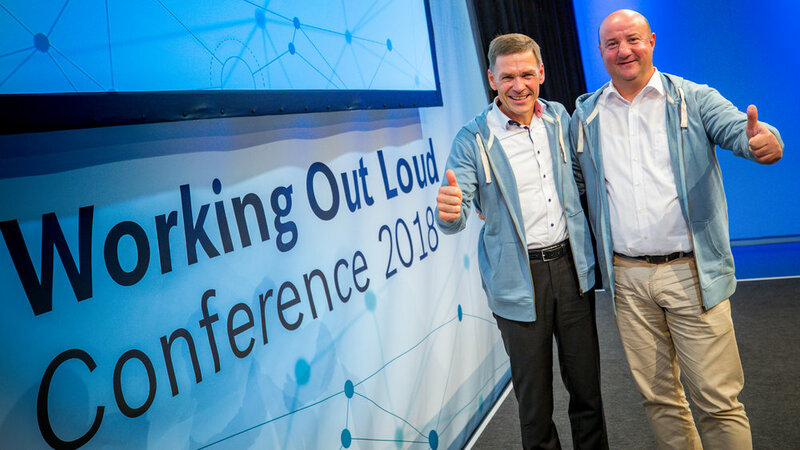 They had been involved in an important culture change program for their company, and saw WOL as a way to help employees experience the new way of working while developing key skills. The question of “How will it scale?” will be asked more often as WOL appears on corporate press releases and becomes a standard development method in more organizations. Here are four ways to answer that question. If you want more information or have feedback about any of these, please leave a comment on this post or send me email. WOL Circles are often introduced into a company by a single person. Over time, as Circles spread, people emerge who want to do more, and a “co-creation team” of six to twelve people forms. They help organize events, create materials, and offer lightweight support for Circles who have questions or challenges. To scale this across locations and divisions, it helps to augment that co-creation team with a network of employees who receive extra training on how to support and spread WOL Circles. This is a familiar “train the trainer” approach, and fits neatly into existing programs that may already have ambassadors or champions or advocates of some kind. WOL is simply another skill they develop. Over the past year, I’ve traveled to many companies to help them launch Circles with an event and workshop. To see people embrace WOL and then take steps to put it into practice is one of the most fulfilling things I do. But relying on one person to do this makes me a bottleneck. Besides, what if they want the event in another language, or in a place I can’t travel to? I am happy to announce the first two licensed partners: Sabine Kluge of Kluge Consulting in Berlin, and Mara Tolja of Workwell Consulting in Auckland. They’re long-time WOL practitioners, and I’ve worked side-by-side on WOL programs with both of them. (Mara formed the first WOL Circle in London. Sabine and I delivered a training program together for WOL Mentors just last week.) Sabine and Mara are trusted friends as well as highly-skilled, creative individuals. I’ve learned a lot from them and enjoy working with them - a wonderful combination. Another way to scale the WOL movement is to keep making it easier to form a WOL Circle and have a good and useful experience. There’s a pipeline of products under development that should help, including a video coaching series, a Circle Journal, Circle Guides in more languages, and a 2nd edition of the book. The first three ways to scale are focused on making it easier to spread and support WOL Circles. But there are some employees for whom Circles might not be an appropriate development environment. That could include executives who find the idea of a Circle to be threatening instead of a safe and confidential space, or who simply can’t make the time for it. It might include employees who work in an environment that doesn’t lend itself to the current WOL Circle format (e.g., a factory, a hospital). To reach those people and enable them to experience (at least some of) the benefits of WOL will require an adaptation of the method. WOL for Leaders, for example, is a new program that’s now in three companies. WOL for Manufacturing is something I’m looking to pilot later this year. The aspiration of the WOL movement, our collective mission, is to improve how people relate to themselves, to each other, and to the work they do. So far, we’ve reached thousands of people in almost 50 countries, and that’s amazing. It inspires me to wonder how we can reach a few million people and still keep the practice consistent and coherent. We have a long way to go, and these four ways to scale are steps in that direction. At the beginning of this year, I got a note from a woman whose department was undergoing a “transformation.” It’s a word I come across in every company I visit. While most people I meet may recognize the need for some kind of change, almost no one likes the process, or the uncertainty that comes with it. She wrote to say that she was in Week 6 of a Working Out Loud Circle, and that her “WOL family gave her stability." Despite anxiety related to the transformation, she was getting new energy from her network each day while she made progress toward her goal. A Circle offers you a safe, confidential space where you can work on your goals and your development without worrying about judgment or competition. For me, the relationships I developed turned out to be a source of strength in addition to a source of ideas and feedback. They gave me the perspective to see things clearly, and the confidence and encouragement to take action. 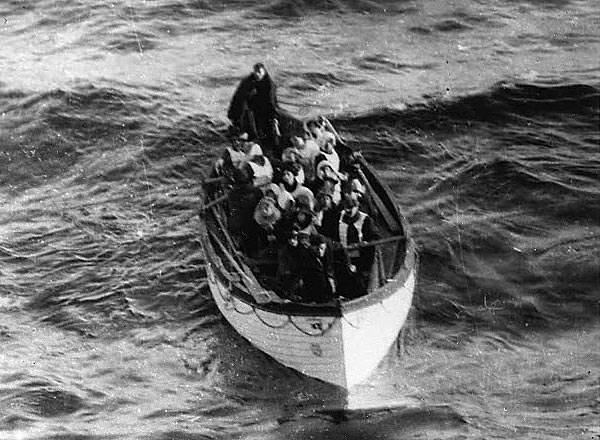 If you’re facing a change in your work or life, do you have a lifeboat? Who’s in it? Your company almost certainly has an innovation program. They may call it something else, or include it in a culture change or digital transformation effort. But no matter the name, companies are all looking to create a more innovative culture, one where individuals contribute more ideas and, importantly, collaborate to bring those ideas to life. If you have such a program, it probably isn’t producing the kind of change you want. Why not? Because despite the tools you bought and the events you held and even the exhortations of management, most people simply aren’t sure what to do and how to do it. Some companies I’m working with are about to try something different. Most companies think of their innovation program as a big suggestion box. Sometimes they'll offer a prize in an effort to get more people to deposit their Powerpoint slides into the box, and organize a committee of managers to select the best ones. Unfortunately, this tends to breed competition and hiding of information instead of collaboration, and produces little actual work beyond the slides. Sometimes, companies even set up a special Innovation Group, a creative silo of its own that’s apart from everyday work and forever struggles to be relevant or make an impact. For a better understanding of how innovation actually happens, Steven Johnson’s oft-cited book, Where Good Ideas Come From, is an excellent primer. Analyzing a wide range examples from over centuries, he showed that innovation isn’t the results of a hidden genius and The One Big Idea, but from the exchange and interaction of many ideas. “New ideas do not thrive on archipelagos,” he wrote. What he meant was that new ideas typically don’t come from people working in isolation. They come from bits and parts contributed by different people who recombine and reconfigure them till the result is an innovation of a kind. We know this is true, and there is example after example after example of people working in an open, connected way. to accelerate the pace of innovation. Yet we rarely see it at work. Why? "I don’t know how." Despite the large number of examples on the web, the vast majority of people have simply never experienced sharing their work online and collaborating with others as a result. And some may not have a convenient facility for publishing content at work. "I don’t know if it will be useful." For the minority of people that know what to do and have a way to do it, there’s often an uncertainty as to whether their contributions would be valuable. They also struggle with how to get the attention of relevant people. "I won’t get credit." A more insidious barrier is when people feel their contributions won’t be recognized. Particularly in a management system of competitive ratings and bonuses, there is a heightened sense of internal competition. Feeling like you’re fighting for your share of a finite pie will grossly inhibit your willingness to contribute and collaborate. The companies I’m working with now are trying to address these barriers in a novel way. They still have the tools, the events, and the management exhortations. But they are also providing employees with help. Each individual that participates shapes their reputation while they develop their personal network. As Circles spread, so does a culture of innovation, of “putting more parts on the table” (as Steven Johnson says), and reshaping and recombining them. Instead of a funnel of ideas leading to a committee, or a beauty contest to see who has the best slides, resources can be allocated based on who has taken an idea, built a tribe around it, prototyped it, and gathered support and evidence. Innovation isn’t just about an idea or a program, it’s about a practice. Imagine for a moment what it’s like to join a new organization, particularly a large one spread across locations. Don’t worry if it’s been a while since you started a new job. Things haven’t changed that much. You go through an orientation process, largely about rules, tools, and values. You get access and accounts, a desk. You meet the people on your team and a few others sitting around you. Then, over a period of many years, you slowly build your network and learn how to navigate the organization. The more connected you become, the easier it is to find who and what you need to get things done. The richer your network, the more valuable you are to the organization. Here’s a way to significantly speed up this process. As part of the orientation process, you form people into Working Out Loud Circles, peer support groups of 4-5 people. They can be in different locations or different divisions, depending on your process and on the kind of connectivity you’d like to develop. Normally, in your very first meeting, you start by picking a goal and listing people related to that goal. These Circles for new joiners will be even simpler, since each person already has a goal of getting to know people in their new organization. To make it easy for them, you provide a curated list of relationships that would be helpful for them given their particular job. This list will include relevant groups and influencers, as well as management. Over the coming 12 weeks, each Circle will follow simple steps in the Circle Guides customized to include your organization’s examples and technology. So the exercises each week will refer to specific people and specific channels, making it straightforward to start building meaningful relationships at work. By the second meeting, the Circle members have already bonded as a group. They’re all going through the same process together, helping each other, and they feel it’s safe and confidential. It’s rare that anyone at work has a trusted mentor, so being part of a trusted group of peers can be quite powerful. Together, they're already making small contributions to people in their relationship lists. It might be as simple as offering recognition by pressing a Follow button on the intranet. Or they might offer appreciation with a comment thanking someone for work they’ve done or a resource they’ve shared. They’re using a range of tools, not for the sake of digital transformation but to build relationships that matter. After the second meeting, their network is already bigger than it would have been using a traditional on-boarding process. Week after week, following the steps the Circle process, the group continues to do a wider range of things in the service of building relationships. They’re joining communities, asking questions, helping other new joiners, finding and sharing useful resources. While they further expand their network and deepen relationships with the people in it, they are developing a new mindset and new set of habits: working in an open, collaborative way. By their last meeting, they're able to Work Out Loud towards any goal. That’s a capability recently described as “perhaps the most fundamental digital workplace skill.” For their next project or problem, whatever it is, they’ll be able to find people that can help them and build relationships so they’re more likely to collaborate. When you welcome employees this way, you increase engagement and connectivity, and you reduce the time it takes to be productive. Instead of learning from binders in classrooms, new joiners learn by doing and collaborating in peer support groups. Now imagine if all your new joiners, in their first few months, developed the habit of working in a more agile, visible, networked way. Imagine the positive change in your culture, the improved effectiveness of your people, and the greater return on your technology investments. When you change how you welcome people to your organization, you have the chance to create sustainable change that feels good. But only if you imagine a better way, and take a step. Changing organizational behavior: top down or bottom up? I’ve seen the change management movie so many times that I know the script by heart. The dramatic descriptions of the burning platform and its dire consequences. The recognition of the difficulties ahead, and the appeal to everyone to engage despite them. The management announcements listing who’s in and who’s out. The lack of actual change. Some of the movies were pure farce. During one reorganization of a large IT department, thousands of people were forced to play a board game so we could understand the new operating model. Then there was the firm-wide program to change our culture, complete with new values on posters and mandatory meetings to discuss them. One executive made a video, making clear his impatience with the bad behaviors he had seen, only to be fired himself for those same behaviors. “Change management” has become an oxymoron, a caricature of bureaucracy captured in popular cartoons. But it doesn’t have to be this way. I was thinking about this during a Knowledge Jam event organized by Cogneon in Nürnberg last week. All the participants were interested in change of some kind, whether it was developing more collaborative cultures and new kinds of leadership or more agile teams and engaged staff. One of the methods discussed was Working Out Loud Circles, and how they helped make change sustainable. The trade-offs are obvious. If management leads the change effort, then employees know it’s expected as part of their job and is likely to have resources to implement it. If employees lead it, it’s because they believe in it. As Peter Senge said, “People don’t resist change. They resist being changed.” So, appealing to employees’ intrinsic motivations is important. Yet without the support of management, grassroots efforts can be trampled, or spread too slowly, or hit limits - “the grass ceiling” - that prevent them from driving meaningful change. Now that Working Out Loud Circles are spreading in dozens of organizations, there’s a discernible pattern. Quite commonly, it starts with a single person deciding to form one or more Circles. They don’t need budget and they don’t ask for permission. They just find a few colleagues who might be open to change, download the free guides, and start. In most cases, the early adopters have such a positive experience that they tell others, a second wave forms, and they begin collecting feedback from people. Then comes a shift. The people in the first few waves use the feedback they’ve collected to get management support of some kind. This could be in the form of an official event or other activities to encourage the spread of the practice. In some cases, HR will get involved in sponsoring the event or include it in their training offerings. Or they’ll commission customized guides that refer to company goals, examples, and technology. These kinds of things make it easier for more people to feel safe that they can join a Circle without fear of getting into trouble in some way. When I worked in large corporations, we spent millions on messages and management related to change, but close to nothing on actually empowering people to do things differently. One way to fix that is to help people help themselves. By equipping and empowering early adopters to drive change, you learn what works and doesn’t work while you collect real stories from real people about the benefits and possibilities. Then, armed with those results, you can leverage the institution to scale and accelerate the change you’ve begun to see. The best way to drive behavior change inside your organization isn’t top-down or bottom-up. It’s both. Next week, I’ll describe a new kind of on-boarding process that’s a good example of this. The group had been through years of budgets cuts and reorganizations, and they were tired of the continued change and uncertainty. Now, at the annual conference, a newly appointed leader addressed them. She acknowledged all they had been through, and the reality of the financial challenges. She made it clear how much she understood and valued their work. She said she wasn’t interested in more reorganizations. Instead, she asked the people to make a change themselves. What she had observed in her short tenure was that the people who knew about their work thought it was excellent. But those who weren’t aware of it thought the organization was broken somehow. The key, she told the audience, was that they needed to be more visible. They needed to share their work - “what you’re doing and why it matters” - so that more people would be aware. Doing so would also give their supporters a chance to make their support visible. That was the best way to take control of the situation they were in. She recognized this might feel new or even uncomfortable for some people. But without being more visible, the only other option was to be a victim of more changes and more cuts. “Meet them where they are,” she told them, describing her early efforts using Twitter. She didn’t start because she loved it or because it came naturally. She did it because she wanted to engage people there and spread news of the good work that might be useful to them. As she finished her talk, she made it clear that “victim or visible” was a choice they had to make. The next presentation was on Working Out Loud, and I tried to make that choice even easier, to help the audience take a step. Think for a moment of all the change programs you’ve seen or have been a part of. Maybe there was a new strategy or new management team. Maybe that led to a culture program, or perhaps a big push to create “one firm” that would be more agile, connected, and collaborative. My own experience is that none of the change programs I’ve witnessed realized what they set out to accomplish. Zero. Not one even came close. Something has been missing, and I think I know what it is. You’ve probably come across articles about the most important elements of a successful change program. Most will cite the critical need for a certain kind of leadership. Or a certain kind of culture. Or the need for certain talent or incentives or measurements or employee development or employee engagement. And so on. These are all good and important things, but of course no one thing is enough for changing how people work. Environment: This is the structural stuff. How people are organized and how they’re paid. The strategic objectives and Key Performance Indicators. The physical space as well as the policies and procedures. Technology: Increasingly, this defines - in both good and bad ways - how people can access information and each other. Behavior: This is the soft stuff. How do people act at work? How do they relate to each other? Not just the one percent of senior managers, but everybody. Most of the programs I’ve seen have focused largely on the environment. 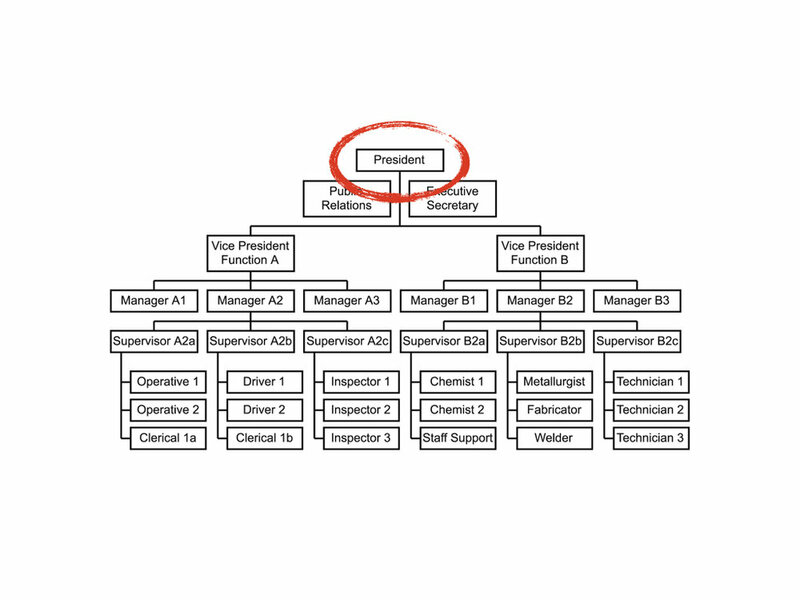 There’s a lot of emphasis on the organization chart (particularly who’s in and who’s out), the strategy, and objectives and measurements. Some included major IT programs or were even technology-led. None focused on behavior. They may have mentioned words like “collaboration” and “values,” but not a single change program helped people experience new ways of working in a way that led to new behaviors, habits, and mindsets. It’s why so many change programs don’t stick. There’s a lot of sound and fury at the beginning, but the vast majority of people keep doing what they were doing, albeit in a new environment or with new technology. As I work with more organizations, several have referred to Working Out Loud as “the missing piece.” They may have an excellent strategy and good tools. But they're usually missing a way to intrinsically motivate employees to work in a different way and a way to spread those new behaviors and scale those changes across the firm. So I’m spreading and adapting Working Out Loud circles inside organizations as a means of addressing exactly these deficiencies. The peer-to-peer process helps with motivation, tapping into an employee’s needs for autonomy, mastery, and purpose. And because circles are largely self-organizing and self-directed, they can spread changes more readily. A book that describes how highly evolved companies have changed their environment, technology, and behaviors is Reinventing Organizations. It includes examples of highly evolved CEOs and modern pay practices, and of “active internal social networks” that make possible a new level of transparency and access to people and knowledge. And in every example there’s mention of changing individual employee behaviors and motivations. Of helping employees learn how to communicate effectively, make decisions as teams, and how to relate to other stakeholders in the firm. Working Out Loud circles are a way to help more organizations do that, to equip and empower individual employees and change how they relate to each other. It can be the missing piece. Have you been part of a successful change program? If so, how and why did people change their day-to-day behavior at work? If you're just embarking on a change program now, is something missing? The new guides are based on feedback from hundreds of circles and practitioners around the world. They’re simpler and easier than ever. If you haven’t formed a circle yet, now is a perfect time to invest in yourself. The last version was published in August 2015, and since then circles have spread to 17 countries. (This week alone I heard from people looking to form them in Austria and Israel.) We’ve learned a lot over the past nine months and put that learning into the new guides. A simpler progression from week to week that makes each step easier and provides positive reinforcement sooner. A two-page summary of the 12 weeks and a short “What to expect this week” section at the beginning of each guide. Introduction of “spiral learning” (revisiting core concepts in different ways) to reinforce the fundamental elements of the practice. No “homework.” The optional exercises and related reading were chosen so you can put in as much or as little effort as feels right for you. New exercises for helping with time challenges. The Facilitator role has been replaced with a simpler “Circle Coordinator” role which can be rotated among members. The guides are designed so anyone can form a circle, download the free guides, and make progress towards a goal they care about while they develop a new habit and mindset. Yet many people would like help forming a circle and advice on how to handle challenges and issues that come up. Such help can make the difference between success and never making it to the first meeting. The best way to get that help is with a new online course we’re piloting. How long? 90 minutes via live, interactive video. What’s included? We’ll place each person in a circle and you’ll go through a condensed version of the 12-week circle process in an hour each week, along with 30 minutes of coaching from me. You'll also have online access to coaches. That will help make your experience a success and better equip you to coach more circles in the future. Organizations who want additional help have additional options. For example, I’m working with a wide range of companies to customize all the materials and train Circle Coaches. For HR, it’’s a distributed, peer-to-peer development program tailored for their organization. If you have any questions - about the guides, the course, or helping your organization - contact me at john.stepper@workingoutloud.com. You can also join the Facebook community or LinkedIn community and ask for advice from practitioners around the world. Form a circle or sign up for the course today. p.s. If you’re asking someone to join a circle, the simplest way might be to send them a link to this TEDx talk “Working Out Loud: The making of a movement.” It provides a simple description of circles and how they’re spreading, and the stories of individuals and companies bring it all to life. New video: “What is Working Out Loud?" What could WOL for Healthcare look like? “What’s one thing I could do better?" What would make next year great?